PML-N President Nawaz Sharif, who always strove to keep family members, particularly females, away from politics, is learnt to have given a green signal to his elder daughter Maryam to join politics and the rumours were confirmed after Maryam admitted that she was in politics while talking to reporters at Home Economics College, Gulberg on Saturday. “My arrival at the function of college and speech is indicative of fact that I am in politics,” she said, as quoted by a TV channel. She said she wanted to further the noble mission of her father and repair the party’s image regarding women. In the presence of Hamza Shahbaz, son of Punjab CM Shahbaz Sharif, who Nawaz has declared his political scion, Maryam’s entry in politics engenders various questions about Nawaz’s political throne. The development seems a major blow to Hamza Shahbaz, earlier considered the new kid on the bloc and being compared to Bilawal Bhutto Zardari. Experts believe that Hamza, who proved his mettle as a true political heir of Nawaz Sharif during his exile, the 2008 election and during the governor’s rule, deserved to be retained as Nawaz’s political successor. 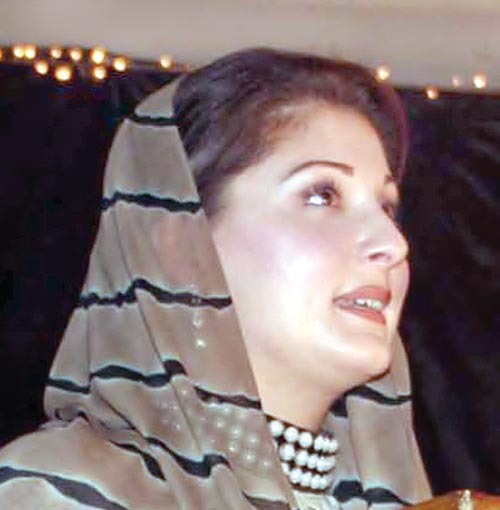 Sources said Maryam’s jump into the political arena implied deep family fissures breeding over the last several years. “Sons of Sharifs did not like one another and same is the case with their daughters, though Nawaz and Shahbaz tried to bridge the gaps,” the sources added. Hazma’s alleged connection with Ayesha Malik also added fuel to fire and pushed Maryam Nawaz to replace him as the political successor, a PML-N senior leader said. “It is also likelihood that after Mayam, one of the sons of Nawaz Sharif — Hassan or Hussain — could announce joining politics,” he added. He said the PML-N big guns hailing from Punjab, who disdained Hamza for his burgeoning power in the province and whopping role in the CM secretariat, also played a vital role in convincing Nawaz to bring a political successor from among his own family members. The issue of joining politics surfaced after Maryam Nawaz, wife of Capt (r) Safdar, turned down all allegations regarding her assets in London in a TV show. It happened for the first time that a female member of the Sharif family appeared on TV and pleaded not guilty. PML-N Senator Pervaiz Rashid neither denied nor admitted Maryam’s entry into politics. “I need to ask the quarters concerned and will get to you after a day,” he added. Maryam Nawaz could not be contacted for comment. Another fool from so called Sharifs family in politics. Not a strange development. In South Asia, political power is inherited by children. Why should Nawaz Sharif hand over all his political inheritance to Hamza Shahbaz? Shahbaz Sharif had cunningly planned everything but after Ayesha Ahad Malik's scandal involving Hamza, Nawaz may have realised the need to introduce his children into politics. Though once they enter politics, they will also have to answer many questions. My advise to her would be to stay away from male MNA/MPA specially Khosa. She is inserted to regain the lost credibility after the latest episode of PMLN scandals. It is a clear indication that PML N has lost its credibility fast vis-a vis PTI, specially after that historic Oct.30 rally in lahore and it is a clear attempt to repair the damage. The ground is slipping fast under shariffs and whatever they will do now will be counter productive as people have decided to replace them with Imran Khan. Inshallal everybody will vote for imran khan to bring new face and honest and credible leader like him, We dont want corrupt shariffs anymore. Please compare size of the house Imran lived in before collecting donations for Shaukat Khanum and the 300 kanal estate in Islamabad he now lives in after collecting donations. I cannot trust him with the National Exchequer. wel come , madame this country is just like ittefaq group, your papa's personal belonging. So come and rule us , the born slaves. My sincere advice to Maryum is to stay away from this dirty polics. I am certain ppl will not support you even in your city. This country is not suitable for female to come out in public. Only female like Firdous Ashiq Awan can survive here. What is your opinion about Fatima Jinnah, Nusrat Bhutto, Benazir Bhutto & so many other women in politics? Gender discrimination must be eliminated. By the way, I am not a supporter of Sharifs. The more the merrier. At least the lady will not be surrounded by scandals which stick to Hamza, Dost Mohd Khosa, Bilawal, Moonis Elahi, Abdul Qadir Gillani and others like bees to honey. She will have to keep her husband at a distance, because he lacks any political skills. Eik aur chore status co .
now in politics how many controverises she will face? The best course for her would be to make public her Intermediate result and Merit List for admissions to King Edward Medical College. so much for democracy.. what about javed hashmi?? That's why Nawaz Sharif has lost his strength -the popular support. And this is why people have moved to Imran Khan in great number because in N league only a member of Sharif has the right to be on TOP. Worker, activists, who strugle and give sacrifices get nothing. FAMILY RULE IN THE GARB OF DEMOCRACY NOT ACCEPTABLE. Hahahhaah.. PML (Sharifs) …. only non sharif to rule over. They think public is fool. She doesn’t know that damage has been done. Its good addition.Welcome and good luck Ma'am. chalo g. Ab ic ka number aa gya… hm kb tk in logon k hathon zaleel hon gay!! Kuch pata nhi…. nawaz sab apni papularity loss kr rahy hain is liye apni khosorat beti ko siasat mai in kr k logo ko bewaqoof banana chahty hongey.. imran khan ki maqboliat se khof zada ye jaddi pushti siasatdan kuch b kr saktey hain.. ye log bokhlahat mai ye sb kr rahy hain .. maryam k aney se kuch b naya nahi hoga bs ek exercise aur.. I am a believer in pluralism if it’s coupled with an independent judiciary and a vibrant media. It’s true that our civil society and the citizenry hasn’t come of age, but I am an optimist. I think it’s good that new players are entering the age old game of politics, even if they are from the same established stock. I think it’s good that Maryam Nawaz has entered politics. It’s a sharp move by the PML-N to counter growing influence of other parties. I wonder why Salman Shahbaz is out of politics? He seems to be a smart young person and could be good addition to politics as well. I don't think that would work coz she can never become Benazir, Her father is not a politician as was Benazir's father.